If you have seen any of my recent YouTube videos, you have already met my daughter, Joy. She is a very dynamic, creative kid and has been longing to start her own blog for quite a while. Since I am a Rather Old-fashioned Mom (with a YouTube channel, an Etsy shop and a blog. I know, I know), I have not given her a cell phone, an i-pad, a laptop of her own, or any other personal electronic devices, so blogging is a bit difficult for her to accomplish. I am, however, a Creative Mom and also an I-Don’t-Want-To-Squash-My-Child’s-Dreams Mom, as well as being a Tech-savvy Mom, so I let her write a little bit of a personal introduction to post here on my blog. And, since I am also a Homeschooling Mom, my little brain saw the opportunity for a writing assignment (we call it delight directed study, a la Gregg Harris). So, she wrote her introduction, and then we made corrections, and now it’s ready to post. She may be popping into the blog again from time to time. 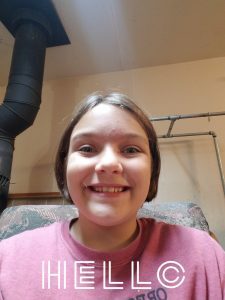 For right now, she is quite enamored of the idea of “guest posting” for me, and using my cell phone to take a selfie for this post is pretty cool, too. My name is Joy, and I have never blogged before now and this is just guest-blogging. Someday, I hope to have my own blog. So, about me. I am Wendelika’s daughter, and I absolutely LOVE to sew. It’s maybe the best thing in the world to me besides Mommy’s very SECRET recipe for… Now, this is my favorite dessert (my favorite dinner is…ummm… goulash, maybe… What about tuna noodle stuff? The other side of my brain is saying). Anyway, back to the subject here (which is my favorite dessert). It is…(drumroll)… CINNAMON ROLLS!!!!!!!!!!!!!!!! Cinnamon rolls are like practically the Best dessert on the planet. Especially Mommy’s homemade ones! So. Now back to the sewing-ness. My sister and I both like to sew. The little bit we do sew, we use Mommy’s machine, but someday we will share a machine that used to be our sister’s, but she never used it, and it’s kind of broken, so we need to get it fixed. Then, THEN, it will be ours. So, that’s me, and thank you for reading! I also wanted to say, I LOVE BLOGGING!!!!!!! It’s SO much fun. I love it! Wende, I LOVE your blog SO much! Btw, you are an awesome mom!